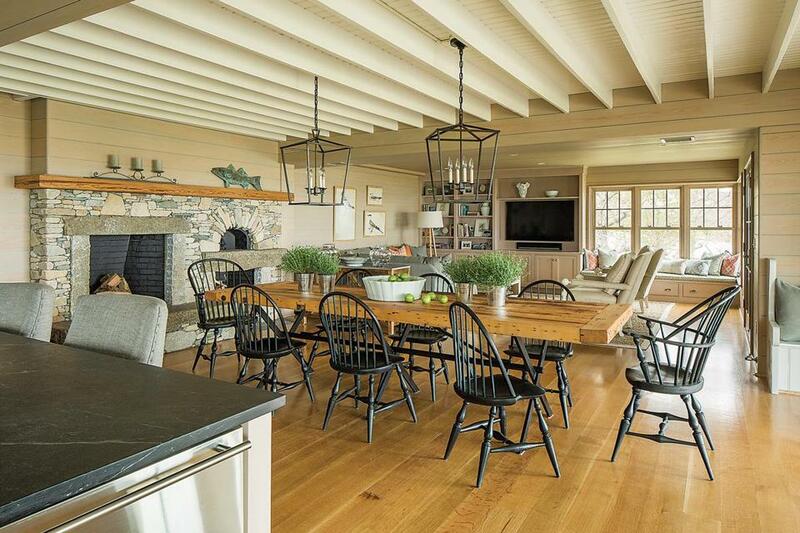 A waterside home on Martha’s Vineyard is built for laid-back family time. 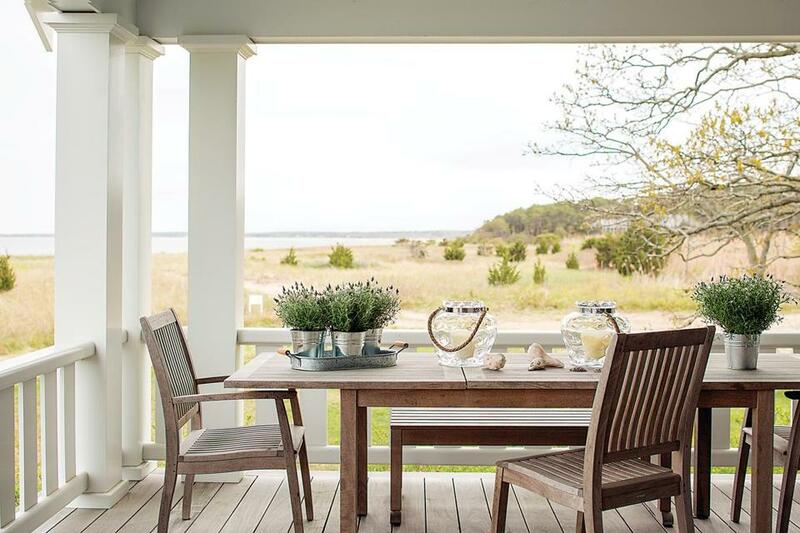 A teak dining table on the porch, with its view of Nantucket Sound, extends to accommodate larger gatherings. 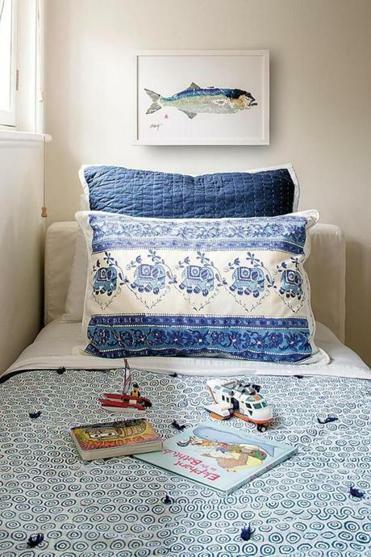 Sayeed designed this hand-blocked bedding, which was printed in India and sewn at a Boston workroom. Blue and white is perhaps the most popular color scheme for coastal retreats, and Newton-based interior designer Vani Sayeed had created just that for these clients in the past. But this time around, for their Martha’s Vineyard home, they wanted a family-friendly design with absolutely no fuss. “They wanted to create a place where they could cook, read, and be lazy,” Sayeed says. Before the design work could begin, the circa 1920s shingled home, which sits on the edge of Nantucket Sound in Oak Bluffs, needed to be lifted onto a newly built foundation. Then the gutting process could begin. Like many homes of the era, the original layout consisted of small rooms with a kitchen sequestered behind the public spaces, cut off from both people and views. Oak Bluffs architect Chuck Sullivan reconfigured the interior to function the way modern families like to live — in a wide-open space. By pushing back the fireplace (local mason Seth Abbott built a new one out of beach stones and granite slabs) and extending one end of the house about 6 feet, Sullivan created an expansive great room oriented toward the beachy vista. Three sets of French doors were added to access the existing porch, which runs the length of the house, so the family could move easily from indoors to out. Square-edged horizontal paneling clads the walls and ceilings, except in the dining room, where original beams and bead board were preserved. It sets a modern, pared-down tone for the space, echoing the neutral colors and materials found in nature. Sayeed worked with the homeowners to find just the right gray-tinged stain, to which she matched the kitchen cabinetry and living room built-ins. 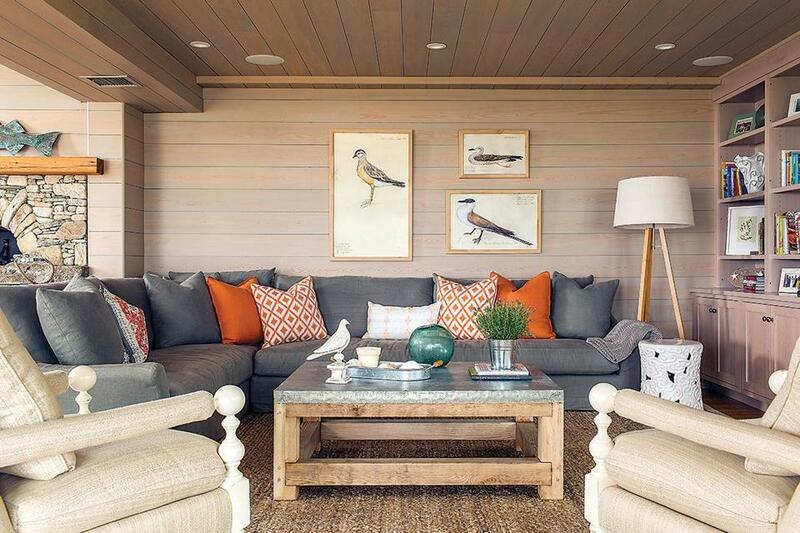 Bird prints from Williams Sonoma make more sense than expensive artwork in the living room — the couple’s young kids like to jump on the sofa. It’s the perfect backdrop for the modern meets hand-hewn furnishings, all of which fit the family’s requirements to a T. They invested in solid pieces that will stand the test of time, including Windsor dining chairs with a matte milk-paint finish made by Sudbury-based woodworker Ray Bachand of 60nobscot, an enormous slipcovered Verellen sectional, and a sturdy, tin-covered reclaimed-wood coffee table made by an Atlanta-based artist and purchased at Artefact in Belmont. The project’s builder, Josh Flanders, used barn wood to make the top of the dining table, which sits on a base crafted by a local metalworker. 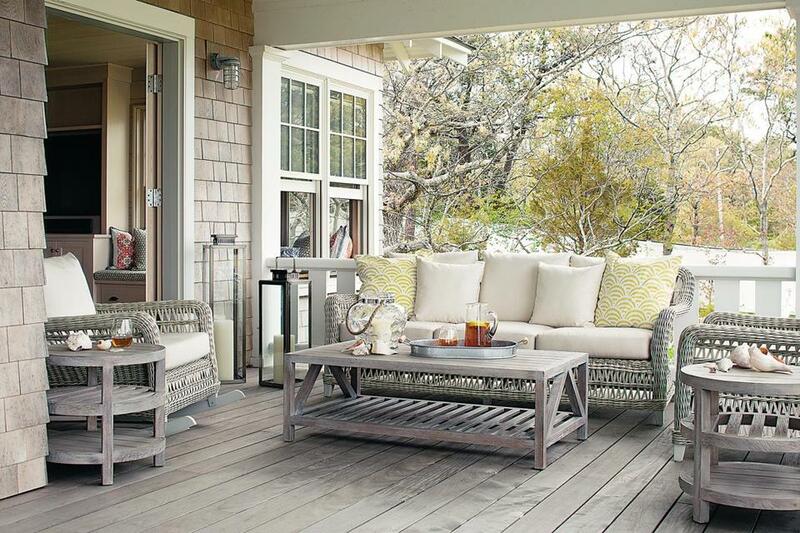 The seating and tables on the porch are from Janus et Cie. This sentiment is honored at every turn. Iron lanterns over the dining table don’t have glass panels to clean, and counter stools, armchairs, and bench cushions are upholstered in all-season fabric. Although a soapstone counter traditionally needs oiling, the homeowners forgo such upkeep, preferring to embrace its patina. Accessories with a global feel enhance the design without disrupting the quiet. An inlaid side table Sayeed brought back from India adds a subtle but fanciful pattern in the living room, as do delicately patterned boudoir pillows by Brooklyn-based design studio Eskayel. In the master bedroom, Sayeed upholstered a bench with hand-blocked fabric by Seema Krish and chose throw pillows made from one-of-a-kind Middle Eastern textiles purchased at Cambridge shop Beyt. The fireplace pizza oven in the dining area ranked high on the homeowners’ wish list. 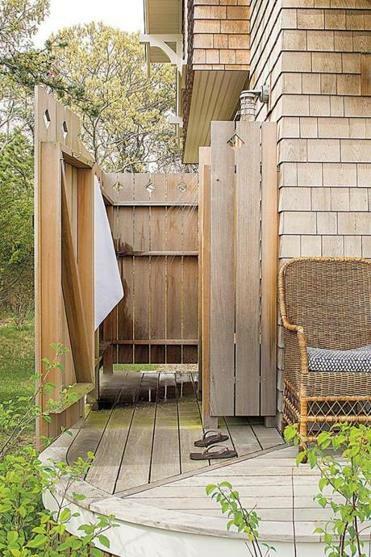 1) Choose a location convenient to a beach path for the entry to the outdoor shower. 2) Include a spigot for rinsing feet and a hand-held sprayer for kids and pets. 3) Be sure you have sufficient fencing and a latch for privacy. 4) Install hooks for towels and wet swimsuits. 5) Add a built-in bench, especially if there are little kids to keep an eye on. 6) If there’s space, include a separate semi-dry area for changing into clothing. 7) Include a shelf for soap and shampoo and a ledge for shaving legs. 8) Choose fixtures that can be removed offseason. 9) Pay attention to proper circulation and drainage. 10) It doesn’t hurt to choose a spot with a beautiful view. A photo caption in a previous version of this story misidentified the source of the porch furniture.